So what exactly is a Digital Press anyway? The word “digital” has been bandied about to such an extent in the printing industry, that I’m not sure it has any meaning whatsoever anymore. In the broadest sense, digital printing could be described as any print process that begins with a computer file and ends up on some sort of imaged substrate. This runs the gamut from the $80 Canon inkjet on your desktop (that rapidly consumes ink cartridges worth their weight in gold) to the most sophisticated devices made by Xerox, HP/Indigo or a host of others. The phrase “digital press” is definitely in. Many of the manufacturers dub their higher end production machines with this moniker. Easily 95% of the digital presses in the marketplace today simply aren’t. Let me explain that . . . they are digital, they aren’t presses. The “press” part of the nomenclature comes from the root word “pressure.” In the case of an offset press, there is actually pressure between the blanket cylinder and the impression cylinder that causes ink to set off (ergo “offset”) onto the paper. Not so with the digital press. For the most part, digital presses are toner devices. Mechanically, they are more akin to a copy machine than a press. Poor Richard is, admittedly, a reformed offset press snob. For a long while, I referred to our color machines as “color copiers on steroids.” We started with a beast from Canon. It was digital in the sense that you could send a file to it. It worked on the principal of a rotating drum. Each sheet of paper went around the drum 4 times with a different color toner applied each revolution. The result was usually fairly consistently horrendous from one sheet to the next and absolutely unpredictable on consecutive days or if the weather changed. It would run 24# bond at the astounding rate of 6 sheets/minute. But times have changed. The Xerox monster we have today runs almost any smooth stock at 10 times the rated speed of the Canon beast. Unlike it’s predecessors, it is very receptive to all kinds of files and color modes (RGB, CMYK, Spot). Ever so grudgingly, I even have to admit that the quality is every bit as good as offset. Maybe it’s even a little bit better. Today I spent a half hour scoring and folding one of the prettiest digital press pieces we have ever produced. A trifold on 100# text with heavy ink coverage, it was designed by one of our university customers. The design was beautiful, but it would have been a bear to print on a press. The front featured a heavy orange solid that had to match up to the reverse. This is the kind of stuff that causes pressmen to go cross-eyed bonkers. We would have wasted 1000 sheets of paper to produce the 1000 brochures that were ordered. As it was, we ran 40 extras digitally for binding waste. The results were spectacular. Watch the solids. Big solids that can be a problem on press can also be a problem when they are printed digitally. Depending on the device, solids can fade, stripe, or ghost. The Xerox monster we’re running now really does a wonderful job on solids and is operator-friendly enough so that we can change a belt or drum when a problem occurs. This isn’t the case with all of the digital presses on the market or with all of the human beings that operate them. Watch the gradients. This problem is sporadic, but there is a more pronounced tendency for gradients to show banding when they are printed digitally. Light screens may also occasionally print unpredictably. Use a consistent color model. I really like the color gamut that our monster produces from RGB files. It is bright and the color pops. It isn’t color accurate, though. Most of the toner devices are CMYK and (if calibrated properly) will emulate a spot color as closely as process color on a press. Beware: combinations of CMYK and RGB may yield some very surprising results. And WYSIWYG still isn’t . . . I’m sure that the photograph of the local news team that was sent to us for their Christmas Card looked wonderful on the monitor at the station, but they were all mellow yellow when they printed on our digital press. Be conscious of this and correct color just like you would for offset. About Color. Color accuracy on digital devices is still a little hit and miss and calibration is as much art as science. One disadvantage to digital presses is the “tweaking” of color. Unlike offset, there are no ink keys that can be used to dial in by eye. That said, if your printer manages and monitors color on their digital machines, colors should be pretty consistent (but not exact) from one project to the next. Remember that calibrations and color profiles for digital presses are specific to both device and paper substrate and it is totally impractical for a printer to calibrate to every paper in existence. This means that color will shift slightly between paper stocks. Color may also shift slightly from day to day due to the peculiarities of the machine, even if it is calibrated regularly. Ask for a hard copy proof. One of the wonderful aspects of digital printing is that you can produce just one copy to look at. It’s not instantaneous, but it is possible. If your project is color sensitive, ask for a hard copy proof on the paper specified for the job.Don’t expect your printer to produce this for free, though. There is time and overhead involved every time a file is opened or transmitted to a device. Printers should and do charge for this. Think Downstream. If you’re printing a flat sheet, you’re safe. But if the printed piece you design will be folded, this might be a problem. As stated above, most digital presses are toner-based devices. The toner adheres to the paper, but “piles up” on the surface to a much greater extent than does offset ink. When folded, the toner tends to crack, producing a ragged edge at the fold. Ask your printer about this before you design. If they don’t have scoring equipment that is designed for digital printing, you probably need to adapt your design so that no solids will cross a fold line. Rickie, our pressman, who’s had nearly 30 years running offset presses of some sort will occasionally pick up an aberration produced by our Xerox monster, wave it in the air, and yell for all the world to hear, “Job Security!” He then heads off to his press and wastes 300 sheets to dial in color for the next run. He has job security, but only because he’s cross-trained. There will be a place for offset for the forseeable future. My generation likes to read stuff on paper and we’re not dead yet. Offset is extremely cost-effective for medium and long runs of a static product. There is no replacement for offset on the horizon when it comes to producing magazines, programs, books, etc. But offset will never be able to produce variable data or images (the subject of a future post) or meet the economies of scale needed for the short and quick color runs that are required in today’s business environment. Digital quality continues to improve. The next digital press we buy will probably use a liquid toner and be able to print on textured substrates . . . the technology to do this is already available. I love my offset presses, but to quote scripture, “Mene, Mene, tekel, parsin.” (Daniel 5:25) The writing is on the wall. As beautiful wife and I left one of our favorite lunchtime haunts on Cherry Street Thursday, we noticed a well-dressed young man hurrying down the street toward us. By my guess he was a professional, in coat and tie, with an expectant and excited shine in his eyes. “What’s the rush?” I queried. It was more that a little crazy in Macon the end of the last week. Oprah Winfrey taped a show here and the presence of such an electrifying personality in our city had the immediate effect of shorting out the synapses of a large part of the population. “Ma’am, all you have to do to approve the proof is reply to the email,” Brian was saying into his headset as we returned to the shop. “Just type ‘OK to Print’ and reply,” he continued to an obviously confused customer. I knew that there was a full scale disruption of the magnetic field in Middle Georgia when I caught a snippet of Sharon’s conversation later in the afternoon. Sharon, our salesperson, was answering questions from one of her customers. She’s not always as diplomatic as Brian and seethed a light expletive under her breath after she finished the call. The crew took off early and I was at the front counter when one of our favorite designers came in with a camera and a sly smile on her face. “And what are you doing?” I asked of her. 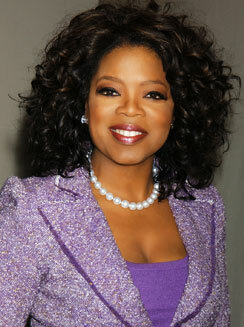 Thanks for coming to Macon, Oprah! Now we know why California is so crazy! I’ve really been trying terribly hard to avoid this rant that has just been coming on for a few weeks now. And it’s still possible that it might be partially deflected through the use of humor or sarcasm, but hopefully not too much cynicism. It all started with the ad I ran for a graphics person. I wrote my standard advertisement, describing the job, stating the qualifications, the work environment and inviting qualified candidates to apply. I used a local job board that has worked pretty well in the past. General Laborer Mainly Construction Carpentry ,Concrete ,Metal ,Roofing & Highway Construction As well as Residential work well enough to be a Choosen Laborer Which Means if the company wanted to send some to win a contract that was I.Which earned me Advanced Wages ,Pay for Mileage & transport and also Lead. One should never accept pay in lead. It causes brain damage. Qualified responses like this were accompanied by resumes from airframe mechanics and a couple of welders. I briefly considered using the same job board to advertise for a sheet metal fabricator, working on the theory that if the ad for a graphic designer produced sheet metal resumes; well, you get the drift. It’s a pretty neat job, especially if you’re interested in learning the technical aspects of graphic design and printing. The working environment at AlphaGraphics is enjoyable, but fast-paced. If you’re ruthlessly efficient and can laugh while you work, please apply. If you need a serene, quiet workplace where you can work in isolation with Mozart playing softly in the background, please talk with our competition. Compensation for this position will start between $9 and $13/hour, depending upon your level of experience. Benefits including health insurance and retirement are available after a preliminary training period. We’re looking for a career-oriented individual. That means that we want you to be serious about what you’re doing and we’d like you to plan to stay for a while. You should have a working knowledge of the Adobe CS Suite (InDesign, Illustrator, Photoshop, Acrobat) and be comfortable working with both Mac OS and Windows operating environments. This is a good position for a talented designer who is starting out, but you need to know the software. Additional knowledge of Quark Express, and the Microsoft stuff is also helpful. A college degree is not absolutely required, but some college or very related work experience is very strongly recommended if you apply for this job. You will be expected to communicate calmly with customers and your co-workers, occasionally in the midst of mayhem. If you can juggle and chew gum while on roller skates, we’d like to talk with you. We do require references from your previous employers. We’re looking for an individual with some solid work experience under their belt. If you’ve changed jobs every six months, don’t apply. In my naivete, I thought that this was a pretty clear description of the position and of the type person that we wanted to hire. And in fact, the resumes did seem, at first, to better fit the job description than did the respondents from my first effort. There were not sheet metal fabricators or airframe technicians and many of the resumes claimed to represent individuals that had actually seen and operated a computer. My initial enthusiasm quickly waned as I began sifting through the resumes, scheduling interviews and actually talking with those who had applied for the position. It is not necessary to read the job description in the advertisement. In fact, it might not be necessary to read the advertisement at all. This would explain why sheet metal fabricators and convenience store personnel are perfectly comfortable sending an application for a job for which they are totally unqualified. It is not necessary to know or keep a record of the jobs for which one applies. This explains the vague response, “Who?” when the applicant receives a call from the prospective employer. It is also perfectly acceptable to have a profane or rude voice mail message resident on one’s phone, prepared just in case a prospective employer calls. “Leave a message and I might call you back,” is not the attitude that I value in someone who might potentially talk with one of my customers. It is not necessary to return a voicemail from a prospective employer who calls not once, but twice. It is not necessary to actually show up for an interview that has been scheduled. It is completely unnecessary to be able to actually use the prerequisite software to qualify for the job. One must only assert that, “it is not a problem for me.” This explains the candidate who lists graphic arts or design as an area of educational concentration, but cannot figure out how to open Adobe Illustrator on a Mac. It is not necessary to have references from previous employers, even when the prospective employer explains that this is a prerequisite. It is also not necessary that the previous employer actually remember who you are. (Seriously . . . one seemingly promising candidate provided a reference and name of a supervisor who vehemently denied ever meeting him. I considered this to be problematic). Compensation parameters listed in the job description are to be totally ignored, as is any requirement for a stable work history. This explains why mid-level managers earning $55000 a year would apply for a job that pays an hourly wage of between $9 and $13/hour and why lots of young people who have experienced 6 or 8 jobs since graduating from college in 2005, now want to experience the position we are advertising. It is perfectly acceptable to think that the job sounds kind of fun and expect the prospective employer to hire you and actually pay you while you “try it out,” notwithstanding that his investment in time, payroll and training all goes out the window when the “next best thing” comes along. I studied for a bit in Germany in my college years. There is a great German phrase that describes someone who has reached and fallen over the precipice of frustration. That individual is said to be “ganz schoen wutend,” missing the umlaut over the u if I recall correctly. It is one of those phrases that really cannot be adequately translated into English. It means something like “entirely and exceptionally furious.” It is descriptive of the degree of frustration I have experienced recently. After exactly 5 weeks of searching, I finally have two viable candidates for the design position. Perhaps I can hire one of them . . . if they show up for the final interview. You are currently browsing the Poor Richard's Printshop blog archives for November, 2007.